“Since 2016, our bilateral cooperation has focused on five fundamental areas of regional development, transportation and mobility, communications and information technologies, industrial development and addressing a post-conflict environment." After Colombia and Korea entered a free trade agreement in 2016, bilateral commercial volume topped $1.25 billion last year, according to Colombia’s top envoy to Korea, who added that his country hoped to export some $570 million of goods to Korea this year. With a population of 50 million -- the third-largest in Latin America after Brazil and Mexico -- Colombia is a growing economy with a young, well-educated and rising middle class. Colombia is part of a regional economic bloc, the Pacific Alliance, which comprises Mexico, Peru, Chile and Colombia and allows tariff-free access across its member states. The alliance is also committed to bolstering trade and investment links with Asia-Pacific economies. On May 25, the member states of the Organization for Economic Cooperation and Development agreed to invite Colombia as a future member. With an accession agreement signed on May 30, Colombia vowed to undertake major reforms and implement laws, policies and practices aligned with the OECD, covering labor, the judiciary, corporate governance of state-owned enterprises, anti-bribery, trade, industrial chemicals policy and waste management. 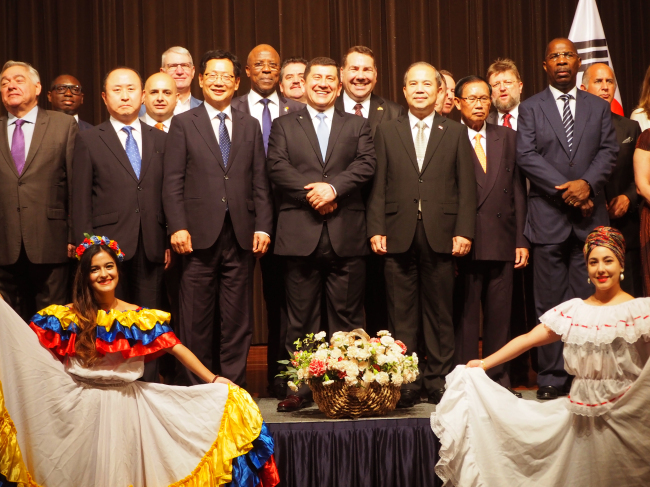 “Since 2016, our bilateral cooperation has focused on five fundamental areas of regional development, transportation and mobility, communications and information technologies, industrial development and addressing a post-conflict environment, for which we recently received important support,” Colombian Ambassador to Korea Juan Pablo Rodriguez Barragan said at a reception last week marking the 208th anniversary of national independence. Last year, Colombian exports to Korea -- mainly coffee, flowers, other agricultural products and coal-- reached $457 million, while Korean exports to Colombia -- such as electronics, cars, and heavy construction equipment and materials -- reached $791 million, according to the embassy. 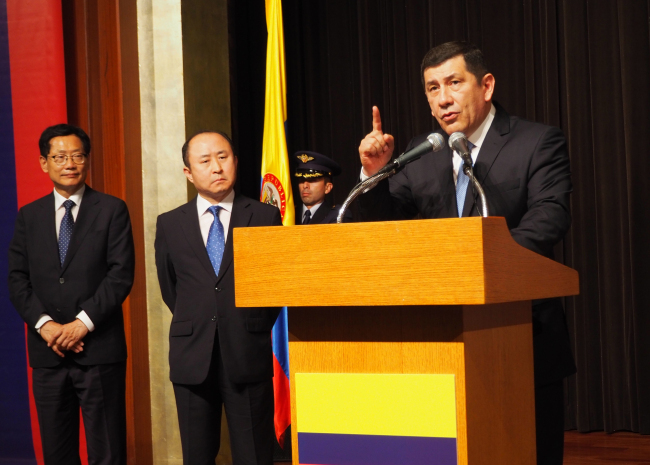 The Korea FTA is the Latin American country’s first such agreement with an Asian economy. It eliminated tariffs on over 200 products with enhanced health and environmental standards and efforts to remove nontariff barriers. According to the Korea International Trade Association, the two countries have complementary trade structures that can be harmonized for bilateral commerce and export to third markets -- with Colombia producing agribusiness products and Korea making industrial goods. Furthermore, South Korean conglomerates SK Holdings and LG Electronics have respectively created an investment fund and inaugurated a distribution center in Colombia. Korean IT service firm LG CNS is involved in three government projects in Colombia, while Hyundai Engineering and Construction is constructing a water treatment plant on the Medellin River. Korean game developer Netmarble acquired Colombia-based mobile game company Brainz in March. Biopharmaceutical company Celltrion and medical laser manufacturer Wontech are considering opening a branch office and learning center in Colombia this year, respectively. 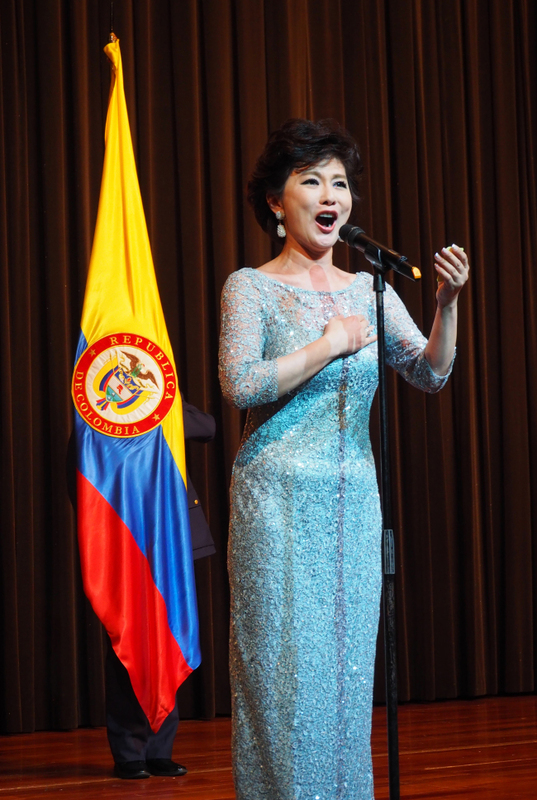 In education, the Korean Ministry of Education, several universities and municipalities have developed various training courses for Colombian professors, also offering financial support for graduate and post-graduate programs. The embassy recently took part in a photographic exhibition at the Korea Foundation with other Pacific Alliance member states. It will also help organize an exhibition at the National Museum of Korea from Aug. 4 to Oct. 28, titled “El Dorado: the Spirits, Gold and Shaman,” in collaboration with Colombia’s Gold Museum, which will feature pre-Hispanic gold and metalwork. “In the defense sector, we have maintained close cooperation and coordinated training events to more efficiently fight transnational crimes and strengthen our strategic capabilities, as well as support our veterans,” the ambassador said. Barragan was a Colombian Army general, serving in the Joint Special Operations Command and 5th Army Division during his 42-year military career. 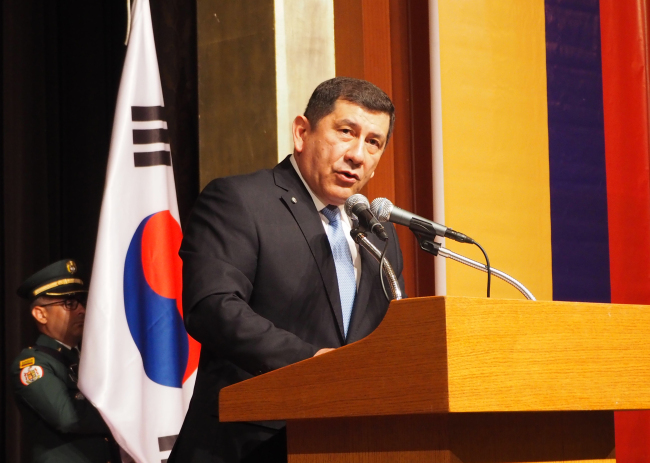 His ambassadorship follows that of his predecessor, former Colombian Ambassador to Korea Tito Saul Pinilla, who was a retired four-star air force general. On Wednesday, a memorial park for Colombia’s fallen and veteran soldiers of the 1950-53 Korean War was inaugurated in Incheon, in collaboration with Asiana Airlines, the Colombian Army, Korea’s Ministry of Patriots and War Veterans and the Republic of Korea Army’s 17th Infantry Division. According to Barragan, 213 Colombian soldiers were killed in action and 448 were wounded during the war, which was the first foreign armed conflict the nation participated in. Three of the Colombian veterans of the Korean War were present at the reception at Lotte Hotel in Seoul on Thursday.